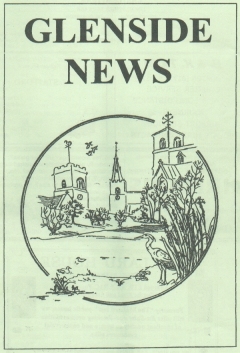 Glenside News is a monthly magazine produced for the villages of Careby with Aunby and Holywell, Castle Bytham, Creeton with Counthorpe and Little Bytham. The magazine is produced and distributed to each household in the area by volunteers living within the parishes. A voluntary subscription system operates for the magazine. Basically if you feel you are able then a donation of £5 per household is welcomed each year. This should be sent to Geoff Clapinson, the magazine's treasurer, at 17 Cumberland Gardens, Castle Bytham, NG33 4SQ. Postal subscriptions are also welcomed ... contact the Editor - information below. ... available to a wider audience ... ex-pats so to speak (may be you?) ! ... stored in an accessible manner for posterity. In this format extracts of the Glenside News appear throughout theBythams website in text format ... that is they look like any other web page. Where we have 'lifted' something from the Glenside News we acknowledge that on the relevant web page. As of October 2003 we have succeeded in publishing the magazine online in pdf format. This means that we are able to more readily upload the magazine to the web each month and also cuts down the length of time it takes us to do it! To view the document in pdf format you will need a pdf viewer. You can download a pdf viewer for FREE by CLICKING on the link below and following the instructions on their website. Older issues of Glenside are still available (some online) in a traditional 'scanned page' format. This is achieved by scanning individual pages of the magazine and then uploading separate images for each page. In due course we hope to be able to transfer some of these to pdf format as well. Because of the size of the pdf files and the older web page images the Glenside magazine pages take a little longer to appear than a 'normal' page (unless you are on Broadband ... which has yet to reach theBythams by the way!). Also, because of the amount of web space (memory) they take up, we only hold a few issues of the Glenside online at theBythams website at any one time. If you would like to see an Issue that isn't currently online then Contact Us and we will either email it to you or upload it asap! Finally ... we only include pages from the magazine on theBythams website if they have 'content' .. so pages containing advertising only are not shown. Copy deadline for the Glenside News is the 13th of the month prior to publication in the case of handwritten copy and the 15th of the month in the case of copy supplied via email or on disc.